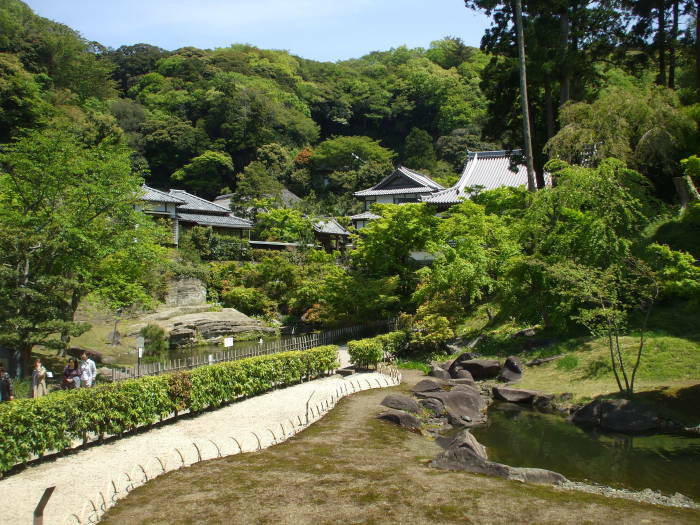 Engaku-ji is the #2 Zen Buddhist temple in Kamakura, the second rank of the "Five Great Mountains". I agreed with the Rough Guide that it was "the most satisfying" of the Kamakura Zen temples. It was founded in 1282 to commemorate the warriors who died during the 1281 Mongol invasion. The regent Hōjō Tokimune had repelled Mongol invasions in 1274 and 1281. He had long supported Zen Buddhism, and he established this temple to honor the warriors who died on both sides of the attempted invasions. Plus, this temple with an unquestionably pro-Japan cause would serve as a center from which to spread the influence of Zen Buddhism. It was a thorough mix of religion and government which, as we have all observed, eventually goes wrong. 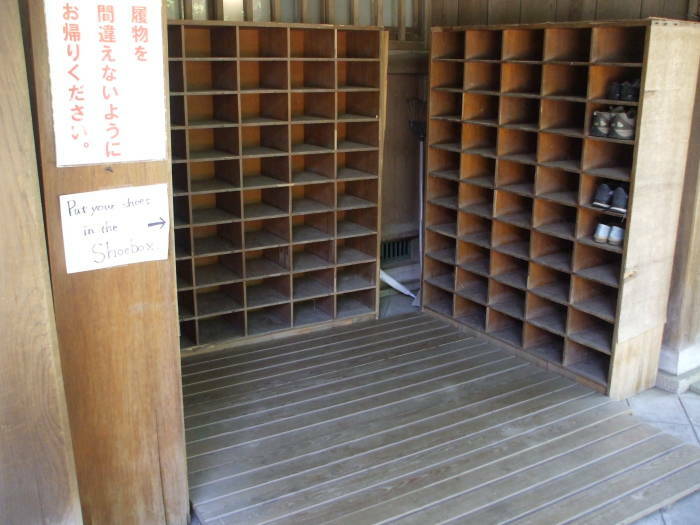 The official story was that soon after construction started, a copy of the Sūtra of Perfect Enlightenment, the Engaku-kyō, was dug out of the hillside in a stone chest. That Sūtra provided the name for the temple. These Sūtras always turned up when you least expected but most needed them. So before long, you expected them. 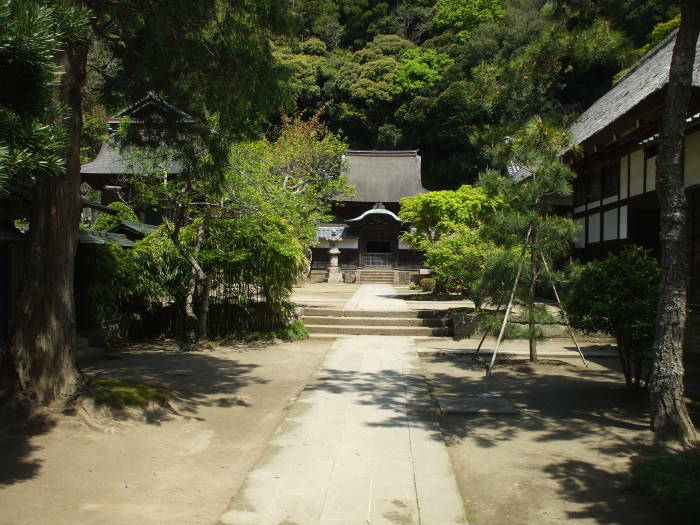 Engaku-ji became the chief center for Zen instruction in the Kantō region. Zazen courses, Zen for the masses, are still held in the temple. The fact that we are living here, now, in the present—this is the true meaning of the existence of the Buddha. Nothing is more precious than this. How marvelous this is! How important this is to realize from the bottom of one's heart! This is the way in which all of us, each in our own fashion, will awaken to the truth and each live, in our own way, a cheerful and happy life. This is the teaching of Zen. 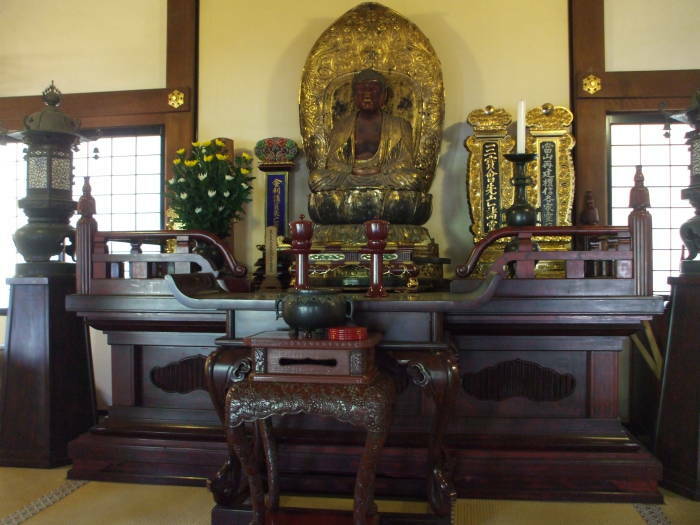 Engaku-ji is now the home temple of the Rinzai sect of Zen Buddhism. These is daily early morning Zen meditation, 0530-0630 in April through October, 0600-0700 November through March. The "Five Mountains and Ten Monasteries System" was a network of state-sponsored Zen Buddhist temples established in China during the southern Song dynasty of 1127-1279. It was adopted in Japan during the Kamakura Shōgunate. Ten "Five Mountain" temples were established, five in Kyōto and five in Kamakura. There were ten smaller temples directly under those, and a much larger number of smaller temples further down. 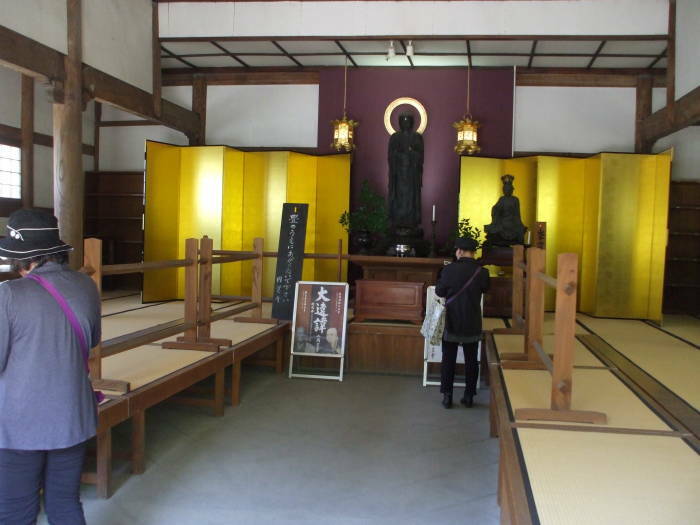 The system's first goal was to promote Zen Buddhism across Japan. However, just as in China, the network of temples quickly evolved into a governmental bureaucracy protected and controlled by the ruling class. That was the Imperial house in China, and the Shōgunate in Japan. The top temples functioned as government ministries, with the nation-wide network distributing the laws. The Shōgunate controlled and stabilized the country, while the temple network gave that control a subtle façade. It appeared as if the Shōgun was simply a devoted patron of Zen Buddhism. Meanwhile the Rinzai sect of Zen Buddhism became powerful and wealthy. After Kamakura fell in 1333, the temples were recognized by the Emperor and they were supported and controlled by following Shōguns. There are now 18 temples within this complex. Below is the Sanmon, the two-storied main gate. 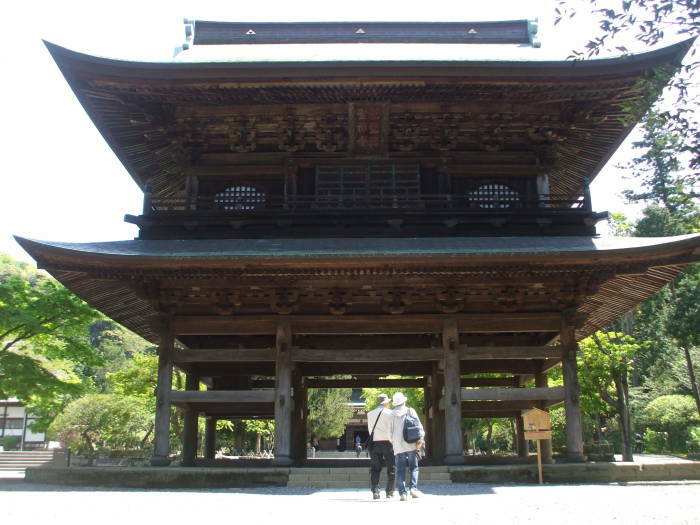 A sanmon or sangedatsumon, a "Gate of the Three Liberations", is the most important gate of a Zen Buddhist temple. 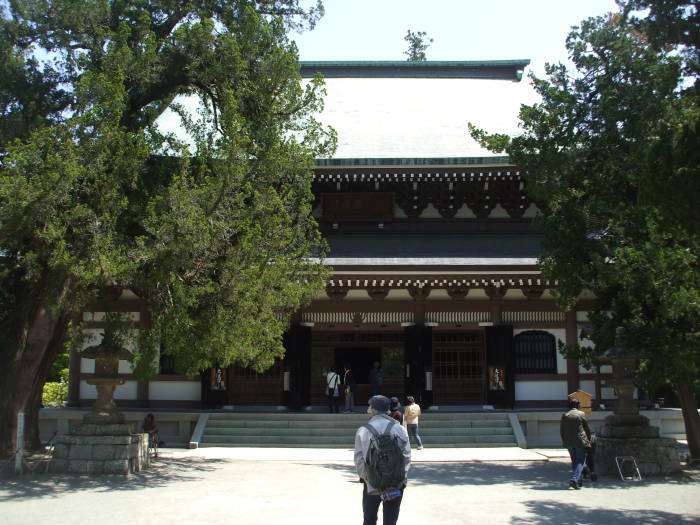 It is usually located between the outer gate or sōmon and the main hall, the butsuden or "Hall of Buddha". The sanmon of a high-rank temple will have three gateway passages. These are the kūmon (or gate of emptiness), musōmon (or gate of formlessness), and muganmon (or gate of inaction). Those symbolize the three paths to satori or enlightenment. The gate has entrances but there are no doors. You can pass through the gate but you can't close it. That emphasizes how the gate is just a symbolic boundary between the normal world and sacred space. 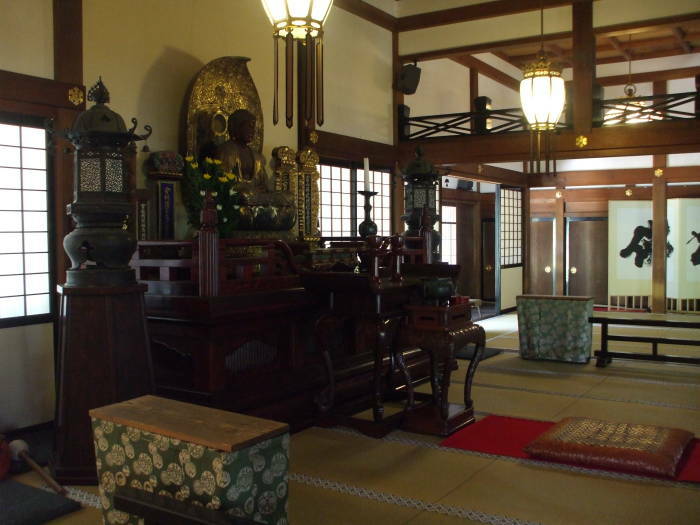 The large Butsu-den, the Hall of Buddha or the main hall, lies inside the sanmon. 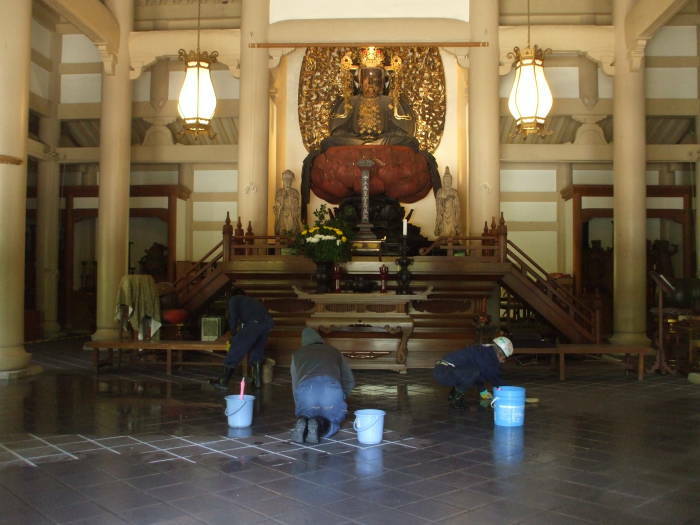 Above we see the Hondō, the main hall, being cleaned. The statue represents Shaka Nyorai, or Shakyamuni Buddha, the historical Buddha. Ōbai-in is a smaller temple with a thatched roof. It houses a statue of Kannon. Kannon is the Japanese name for the Bodhisattva of Mercy. Bodhisattva is the Sanskrit term for a figure with great compassion who strives for awakening, empathy, and compassion for the benefit of all sentient beings. The original Buddhist figure was Avalokiteśvara, a bodhisattva who embodies the compassion of all Buddhas. The concept and representation of Avalokiteśvara changed as Buddhism expanded to the north. Mahayana Buddhism and Tibetan Buddhism associate Avalokiteśvara with the mantra oṃ maṇi padme hūṃ. Tibetan Buddhists believe that Avalokiteśvara, who they call Chenrézik, emanates as the Dalai Lama, the Karmapa, and other especially high lamas. Buddhism in China recognizes Guanyin, a slightly modified version of Avalokiteśvara. Despite being called a goddess, Guanyin is often depicted as both female and male to demonstrate a limitless transcendence beyond gender. Buddhism then spread from China to Japan. The Chinese characters for "Guanyin" are pronounced in Japanese as Kannon. So, the central statue is Kannon / Guanyin / Avalokiteśvara, the Bodhisattva of Mercy. Shari-den, the reliquary hall, is ahead of us. It houses what is claimed to be a tooth of the Buddha, in a reliquary cabinet between statues of the Bodhisattvas Jizō and Kannon. 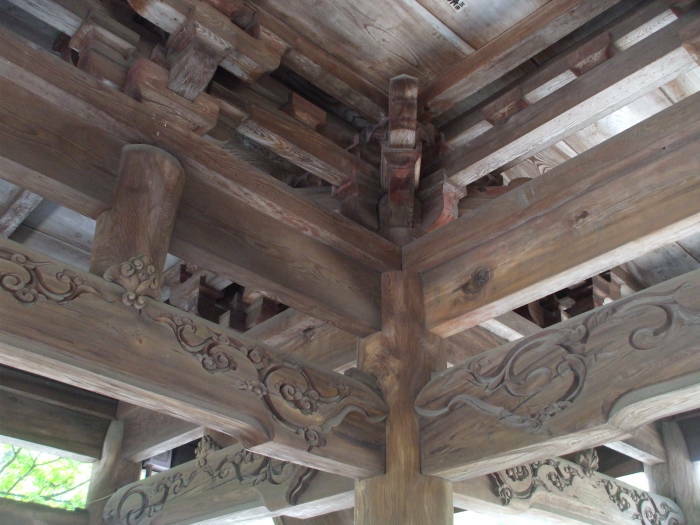 Shari-den was built in the 16th century in the style of China's Song dynasty. 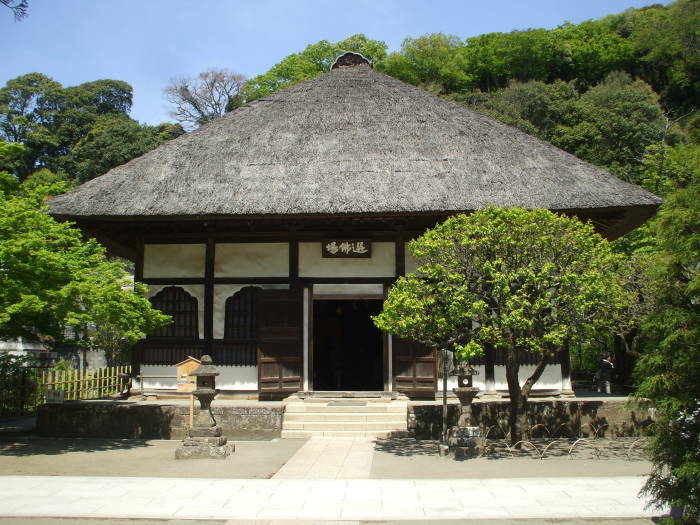 It is the only National Treasure building in Kanagawa Prefecture. We'll go into one of the large teaching halls. 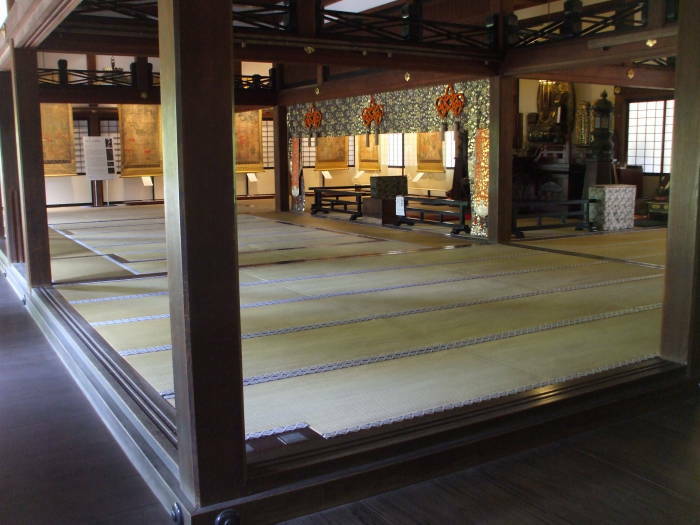 As a general rule, you take off your shoes when you step onto a wooden surface, certainly when you step onto tatami mats. The Engaku-ji temple complex has some large gardens.